I had seen people talking about this brand on twitter, which is why I wanted to try the Petal Delicate Eye Serum. I can understand why so many people love the products – I was not dissapointed! I always tell my clients about the importance of using an eye cream and I have tried most of the luxury eye creams on the market. It is hard to find the perfect eye cream, as some creams are very moisturising, but makeup does not sit well on top and if they are too rich, it can make eyes ‘puffy’. Then there are eye creams which can lighten the area under the eye, but don’t provide the eyes with enough moisture. The Petal Delicate Eye Serum is a little pot of magic…. it does it all!! 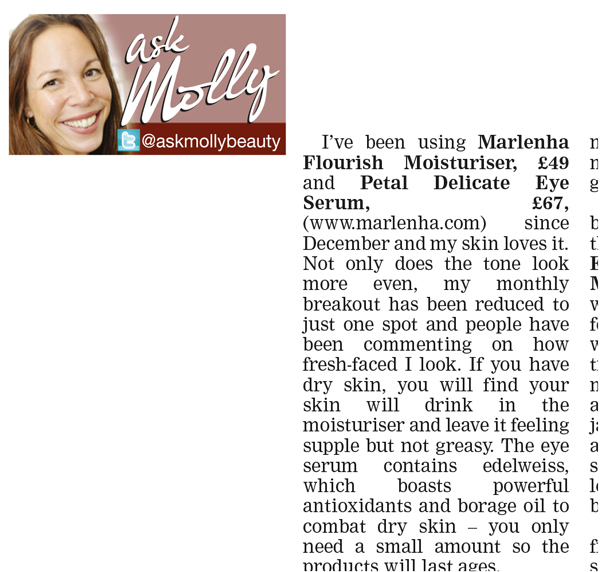 After just one night of using this eye serum, the skin around my eyes was so moisturised and ‘plump’, I was delighted. The area under my eyes look revitialised and definitely brighter – I was really surprised how a product good achieve such amazing results in such a short time. I also have no hesitation in recommending this product to any of my clients, even those with sensitive eyes as they was no stinging whatsoever. 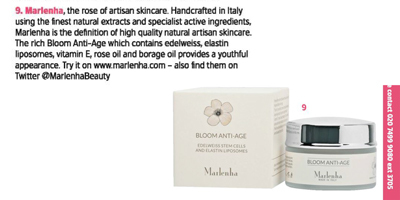 For such a gentle product to give such amazing results is so impressive – Marlenha really have produced something special! 10 out of 10 from me! “It felt rich and moisturising, was easily absorbed and seemed to improve the little lines around my eyes and deeper wrinkles elsewhere on my face. After a month of use my skin looks better than before with even colour and texture and I have received compliments on my skin”. After a couple of weeks of regular use, I noticed that the delicate skin around my eyes looks much plumper and it feels very, very smooth. My dark circles seem to be slightly less noticeable and easier to cover up with concealer. I usually struggle with it, so it’s a really good sign. I also noticed that the fine lines around my eyes became almost invisible”. Flourish Moisturiser sunks immediately into my skin leaving it nourished. 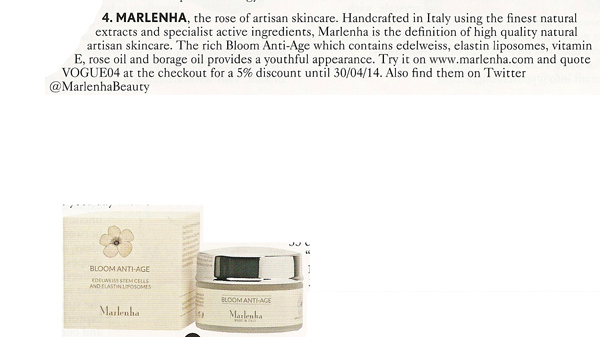 My skin was left feeling not only supple but also, and most importantly not looking overtly greasy”. “Since using this product my skin has improved dramatically and I absolutely love using it after a bath, then getting into bed cloaked in its soft sensual fragrance. Fresh Dew Body Butter is one of the nicest body lotions I’ve ever used”. 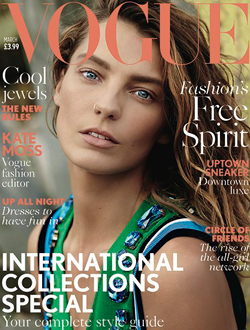 “I’ve found the skin around my eyes to be brighter with dark circles reduced and the skin plumped and hydrated”. “The eye serum is a very delicate serum, with a milky consistency that is great for moisturising the area around your eyes without irritating it…….The body lotion has a beautiful relaxing floral fragrance that stays on your skin for hours. It also has a light texture that moisturises your skin without leaving it greasy. It absorbs quickly and leaves such a lovely nourishing feeling on your skin, like if you just came out from a pampering session”. “My skin feels amazing. It’s moisturised and plumped and dewy and not only have the very fine lines disappeared, it’s also had a minimising effect on the deep nose to mouth lines that I have”. “The consistency of this moisturiser is rich, but it doesn’t feel oily and it doesn’t leave a residue. It sinks into the skin quickly and provides instant hydration. It is very soothing and perfect for dehydrated skin; exactly what I expect from a good moisturiser. I absolutely love the way it feels and applying it is a real pleasure. I use it morning and night after cleansing, toning and massaging two different serums to my face or an oil, if my skin feels really dry”. “My skin drinks up this lightweight cream, absorbing it in seconds, leaving my wrinkles looking smoother, restoring my combination skin’s moisture balance. 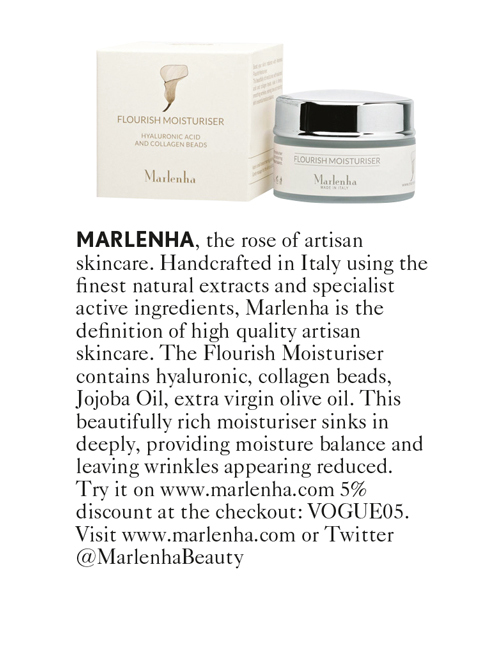 After the first week of using Flourish Cream, my skin felt much firmer, hydrated, nourished”. “The body lotion has a beautiful relaxing floral fragrance that stays on your skin for hours. It also has a light texture that moisturises your skin without leaving it greasy. It absorbs quickly and leaves such a lovely nourishing feeling on your skin, like if you just came out from a pampering session.”. “After about three weeks of use I noticed that the area under my eyes looks more even and my eye area looks brighter. It also makes a lovely base for your concealer and eye-shadow”. “I feel that it has made a great difference to the look and feel of my skin – it has been smoother, softer, more even and overall much more hydrated”. “Despite the plethora of oils, the texture is still incredibly light. It feels like a gel-cream hybrid, sinks in really quickly and visibly plumps up the skin. It acts as an excellent base for makeup”.